CHICAGO (WLS) -- A man was shot Friday night at a CTA Green Line station on the Near West Side, temporarily stopping train service. Trains resumed normal service around 9:20 p.m.
At about 7:20 p.m., a weapon was fired during an altercation at the Ashland/Lake station, said CTA spokeswoman Tammy Chase. Police said the victim, 30, was involved in a verbal altercation with two men that turned physical. The person was shot in the upper left shoulder. The victim was taken to Stroger Hospital in serious condition, according to the Chicago Police Department. Two persons of interest were questioned by police. The police activity impacted Green and Pink line trains. Green line trains headed toward 63rd Street and Pink Line trains headed to the Loop were standing, according to a 7:30 p.m. tweet by the CTA. 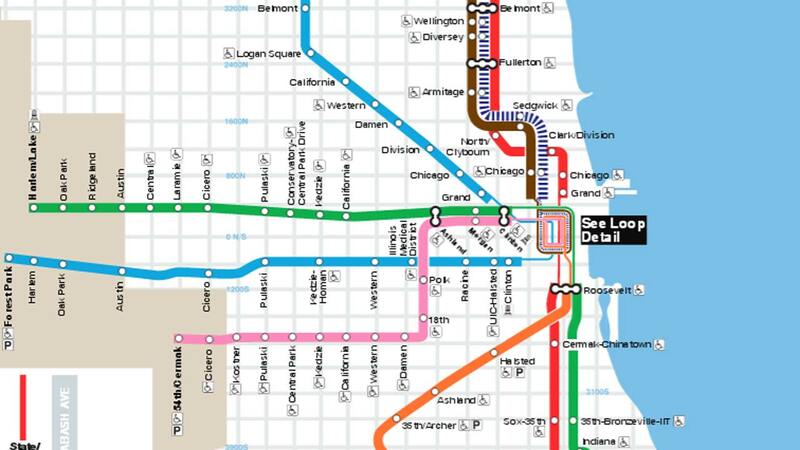 Shortly afterward, the CTA said that Pink Line trains were operating from 54th to Polk only, then connecting with Blue Lines at Racine. Green Line service experiencing delays; board all trains on the Harlem-bound side at between California and Morgan. 63rd-bound Green and Loop-bound Pink Line trains are standing at Ashland/Lake due to police activity; crews working to restore service. Pink Line trains operating 54th to Polk only, then connect w/Blue Line at Racine, due to police activity at Ashland/Lake.